Where were YOU when these things were happening in the VB Company timeline? Completed the 200,000 square-foot expansion of the distribution facility in Roanoke, Indiana; increased company's presence to all Dillard’s locations; and launched a relationship with Von Maur, and items are carried in all of their locations. Entered the Japanese market, opened the Vera Bradley Design Center in Roanoke, Indiana, and launched products at 65 Dillard's locations. Vera Bradley participates in the Tournament of Roses™ Rose Parade™ with the Hope Garden float. Breast cancer survivor and actress Cynthia Nixon along with other survivors rides on the float. To date, 3,000 independent retailers carry our products across the nation. VB opened their first outlet store at Chicago Premium Outlets in Aurora, Illinois. Vera Bradley attends the Daytime Emmy Awards in Los Angeles and the Tony Awards in New York City to give gifts in the celebrity lounges. Vera Bradley celebrates its 25th birthday with a 25thAnniversary Collection. Ten more Vera Bradley Signature Stores open across the country. Vera Bradley attends the Super Bowl in Miami and the Sundance Film Festival in Park City, Utah, to give gifts in the celebrity lounges. More than40,000 women from across the nation travel to Fort Wayne for our annual Outlet Sale, our largest crowd to date. Vera Bradley introduces the pattern Java Blue, our best-selling color to date. The Vera Bradley Foundation for Breast Cancer makes a $6.8 million pledge to the Indiana University Cancer Center bringing their total giving to $10 million. The first Vera Bradley Signature Store opens, Vera Bradley at Clay Terrace in Carmel, Indiana. Seventy five Sales Representatives now service Vera Bradley accounts nationally. The ninth Vera Bradley Classic raises $475,000, surpassing$2 million to date. Barbara meets President George W. Bush at a Trade Promotion Authority meeting at the White House. The company also introduces its second pattern to benefit breast cancer research. Linda Malkas, Ph.D. is named the Vera Bradley Chair in Oncology and brings her research team to the Indiana University School of Medicine. Vera Bradley staff grows from 60 to 90 employees. The seventh annual Vera Bradley Classic raises $385,000, bringing the total money raised to $1.5 million. Vera Bradley launches its first special pattern to raise funds for breast cancer. More than $126,000 is raised for the Foundation. From its humble beginnings 17 years ago, Vera Bradley is now sold in all 50 states,as well as Europe and Japan. Patricia and Barbara establish the Vera Bradley Foundation for Breast Cancer. The Foundation pledges $1.2 million over the next five years to Indiana University School of Medicine in Indianapolis. The pledge endows a chair in oncology for breast cancer research. With continuing growth of the company, the building is remodeled and expanded, providing 27,848 total square feet. Barbara and Patricia established a women's Pro-Am charitable golf event, The Vera Bradley Classic. The benefit raises $64,000 for the American Cancer Society. What started as a small, annual outlet sale in a rented tent space grows so big, the company decides to move it to the Allen County War Memorial Coliseum in Fort Wayne. With steady growth, a new building is erected and the company moves into a 15,538 square-foot facility in Fort Wayne. The business moves from Barbara's basement to a rented space in a local paper company's building. While at a layover in the Atlanta airport after visiting Barbara's parents, Ed and Vera Bradley, Barbara Bradley-Baekgaard and Patricia R. Miller revisit the conversation around the serious shortage of feminine and stylish luggage. Investing $250, they begin a company the very next day in Barbara's basement, Fort Wayne, Indiana. Model, Mother, Hostess and Friend. 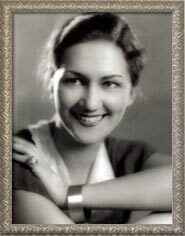 Veronica Bradley, born August 9, 1909, was the mother of Vera Bradley Co-founder, Barbara Baekgaard and even worked for the company, as a sales representative in her Miami, Florida, community until she died in the early 1990s. Vera was a special woman, who was chosen in the 1930s by Elizabeth Arden herself to model. Vera's classic style and grace inspired Barbara and Patricia to name their company after her in 1982. Those who knew Vera agree that her life was always full, fun, and colorful!